It’s simple. Since Verbum Catholic Software was released there is no need for heavy, cumbersome books and Bibles. Everything is now on my laptop and synced with my iPad and iPhone as well as in the cloud on the Verbum website. I literally have thousands of Bibles, books, resources, maps, atlases, Greek and Hebrew dictionaries, photo albums, commentaries, the Catechism, Fathers of the Church and much more. Reading plans, prayer lists, study guides, video learning and more all wrapped into Verbum 7. Verbum 7 is the latest version of this remarkable product. The whole of the Scripture and Catholic tradition can be at your fingertips, even in your pocket. I have just downloaded it and I’m thoroughly impressed with all it’s new speed, features and documents. I can sit on an airplane and have a massive searchable library on my lap all connected with millions of hyperlinks. 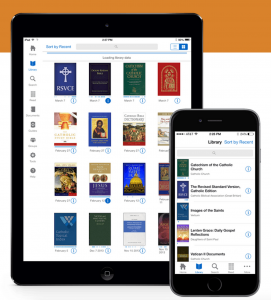 Verbum has released version 7 of their Catholic and Bible study software. I’ve been using earlier versions of Verbum/Logos for 25 years and have seen it go through many versions–from floppy disks and CD-ROMs (with a handful of Bibles and reference tools) to a powerful research tool and a massive theological library that you can access on your desktop, laptop, tablet, phone and even the internet — all synced together and backed up on the cloud. Year after year, they improve it with new features and new books. Every version that comes out is more powerful than the last, and version 7 is no different. 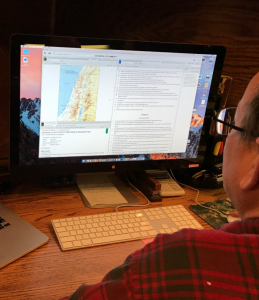 They’ve connected the RSVCE, NABRE, and Latin Vulgate word-by-word to the Greek and Hebrew texts they were translated from, so you can easily see and compare how these different translations work. 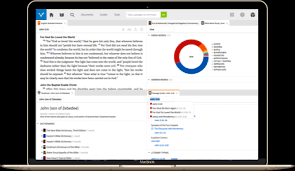 They’ve built a tool that generates a concordance so you can browse all the words and references of the Bible, the Catechism or any book in your Verbum library. They’ve added more books to the libraries including writings of Church Fathers, classic works of Catholic spirituality, Bible study tools like the Ignatius Catholic Study Bible, and more. Go to verbum.com/steveray to see more and get a 10% discount. If you want more information on what’s new in 7, you can look at https://verbum.com/7 (or go to https://verbum.com/features and look at the things labeled “new”). A complete list of features that are new in 7 can be found at https://community.logos.com/forums/p/129206/839464.aspx#839464.